When restaurant owners Kate and Bryan Dickens – she runs the front of house, he is the chef – decided to move their beloved local restaurant to a bigger space they may not have envisioned it would take two years. With the guidance of design studio Atelier Wagner, they slowly transformed a heritage-listed former courthouse in Port Melbourne into a warm yet lofty space. 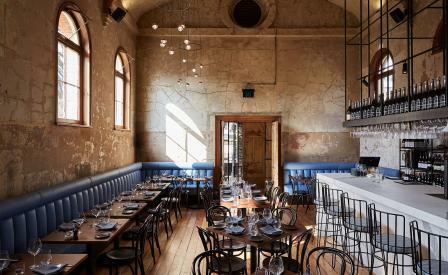 They’ve retained the cracked sandstone walls, baltic pine floors and timber rafters and added crackling fireplace, flowing organza drapes, marble bar and muted blue leather banquettes for a contemporary edge.